Keep on Rowland: DIY: Let's give Candles another shot. DIY: Let's give Candles another shot. Oh hey! Remember that time that I tried to make my own candles and shortly afterward I realized that I actually spent more money making the candles then it would have cost me to go to Anthropologie and buy some? Yeah, that was awkward. I had great intentions. It is always fun to make things yourself. 1. You get the satisfaction of saying that you made it. 2. You get he creative fulfillment and experience of making it. 3. It can usually be a cheaper way. 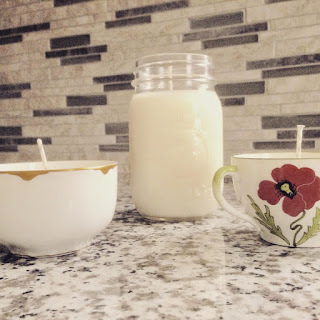 Although the candles I made last January were cute <who doesn't love a candle in a tea cup or a mason jar> , clean burning and not very difficult to make, I made some rookie mistakes that ending up costing me. Determined that I could do a better job, I set out to make another batch. Not the best. But better. 1. I dumbed down the recipe. It is so annoying to me to go online to try to find an easy way to do something only to be inundated with a thousand very detailed articles over. Can someone just give me a step 1, 2, 3 article, please? Thanks. 3. It was easier. <Mostly because I had done it before and decided not to stress over it so much. So, let's get this party started. Although you can read the full DIY article here for my original candle making experience, I have modified and simplified it ALOT and listed it again below. It's not that hard. Here's what you do. I would suggest starting with a 5lb bag of soy wax. It burns cleanly and cleans up well in the candle-making process. For me, the best place to buy this quantity of wax is Amazon. You should pay between $15-20 for this amount of wax. Fragrance grade oils are the way to go. They cost around $1 per ounce and you will need about 2 ounces per pound of wax. 3. Buy your wicks-- also best on Amazon. 5. Set your wicks in the containers. 6. Melt your wax in a double boiler. 7. Pour in your wax. Depending on the size of your container, an easy amount to manage per load for me is 2-3 lbs of wax. 8. Let the water boil and melt the wax completely. Stirring occasionally. This take some time. Example: If you melt 2 lbs of wax, then use 4-6 ounces of fragrance oil. 10. Let it cool down for a few mins, then pour into your containers. Let them sit in a cool dry area for about 24 hours before burning. See, wasn't that much easier this time? I chose lavender again and also a vanilla cookie--which doesn't really smell like a vanilla cookie at all, but it smells really delicious, so who cares. Maybe the third time is the charm and it will really be good then. Progress over perfection, my friends.